Are you planning a trip to the mall with a list full of errands? Looking for something fun to play with the kids while trying to complete your long “to do” list? 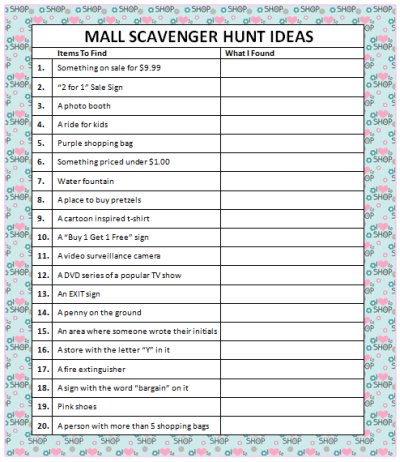 Then try these mall scavenger hunt ideas with this free printable. Rather than sending them off in a race around the mall, just have them point out their findings to you. Older children can write their answers down on the free printable game. This game is general enough to be played at any mall and since each visit to the mall is different, the game can be played over and over again with each visit. How many of these things could you find in the mall? If you love this game, we have another Mall Scavenger Hunt game for you over in our post about hosting a teen’s birthday party in a mall. Moms & Munchkins is filled with free printable games! Head over to our Free Printable Game page to check out the selection of freebies. We have charades, scavenger hunts, word searches, word scrambles, BINGO cards and so much more! We’re always adding new ideas so follow along on Facebook, Twitter & Pinterest. We’re excited to have you as part of our community!